OP1774. 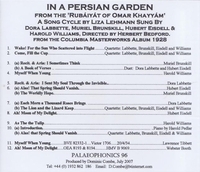 IN A PERSIAN GARDEN – Excerpts (Complete, as recorded) (Liza Lehmann), recorded 1928, w.Herbert Bedford directing Dora Labbette, Muriel Brunskill, Hubert Eisdell & Harold Williams; Lawrence Tibbett: Myself when young; Webster Booth: Ah! Moon of my delight. (England) Palaeophonics 96. Excellently transferred from the legendary 78rpm rarities, w.Elaborate handsome 12pp Brochure, facsimile from the Original English Columbia Masterworks 78rpm set.